Note : Travelers will only receive a login in combination with a reservation. Location: 18 meters above sea level. next to the golf course close to the beach. Wir - 2 Ehepaare - genossen die Tage in Maspalomas sehr. Wir können die Unterkunft nur weiterempfehlen. Besonders der grosszügige Umschwung mit den mit der Grillstation haben wir sehr geschätzt, wie auch die Ruhe und die Einkaufsmöglichkeiten in unmittelbarer Nähe. Als Golfspieler war es besonders angenehm direkt einen Platz in Gehdistanz zu haben - die anderen Golfplätze waren mit dem Auto ebenfalls innerhalb weniger Minuten erreichbar. We really liked the villa. The accommodation was superb as were the arrangements. 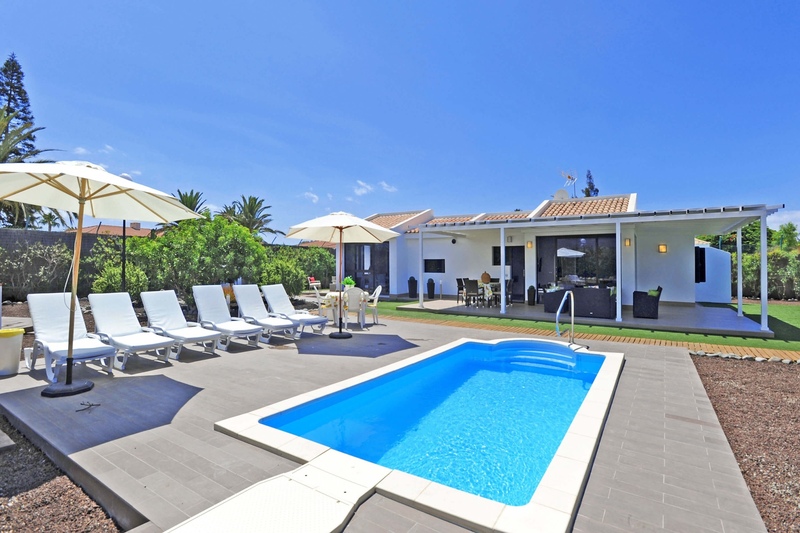 Would definitely book again if looking for a villa in Maspalomas for 5/6 adults. Nice house with big terrace and garden which included small swimming pool and good barbeque place. Kitchen includes all equipments what you need for normal cooking. We barbecued several times. House with 3 bed rooms and 2 toilets/showers was big enough for 6 persons (Granny, Mom&Dad, 7 years old child and 19 year’s old couple). Quiet area, some time we could hear quietly nice live music from hotel nearby but it was only day time and not in the evenings. Short walking distance (5min) to Golf course or tennis court. Possible to walk to the beach (15min). It was easy to get taxi front of the house or walk short distance to bigger road where was more traffic. Local bus stops was also nearby in the bigger road. Friendy booking service and possibility to get taxi service from and to Airport. Sehr schönes und grosszügiges Anwesen, sehr gepflegt, ruhige eher abgelegene Umgebung, jedoch verkehren Buse und Taxi, auch zu Fuss zum Faro 2 zum einkaufen ideal. Das Pool zum planschen und abkühlen ist wunderbar geeignet. Das Haus ist mit allem Ausgestattet was man in den Ferien braucht. Wir empfehlen die Unterkunft weiter und auch wir kommen wieder. Schönes Haus mit guter Ausstattung. Wir waren sehr zufrieden und würden das Haus wieder buchen! Wir haben uns sehr gut im Haus und Garten erholt. Any question? Special wishes? We are here for you! Look, what a beautiful house! The email was successfully sent. © Copyright 2003 - Present: The Dream Destination Travel S.L.